We are available for hourly contract work for the IBM i, AS400 Platform. We develop on and maintain the IBM System i. We’ll integrate your systems with the other platforms. We have programmers/developers with RPG, Java, SQL and web expertise. Arehart Consulting, LLC in Dayton Ohio, purchased our first AS/400 in 1988. This platform is now known as the IBM System i or just IBM i, but we still like to call it the AS/400. Of course many also refer to its middle name of IBM iSeries. IBM has done an interesting job of constantly renaming this great system. If you or your team needs RPG and database programming expertise on an IBM AS/400, from the same person that is a Java and general SQL expert then please contact us! We love integrating the IBM AS/400 with the rest of the world. We can help you make decisions based on our experience with several integrating projects. By RPG we mean any flavor from RPG II, RPG III, RPG IV, RPGLE, RPG-ILE, RPG Free. Of course we also have CL, DDS and DB2/400 expertise as well. We can service nationwide and locally all of Southwest Ohio, including Cincinnati, Middletown, Springboro. Print barcode labels direct from print queues for shipping labels, product labels, etc. The IBM System i is a wonderful platform. While we love all other modern platforms, we still hold a special admiration for what we still consider to be a very modern platform. In the nineties it was an incredible machine. The AS400 (as we like to call it most of time) still is modern and amazing today. The difference now is there are other reasonable choices of platforms that are also stable and easy to maintain. So, while the AS400 is a great platform, it now has worthy competitors. Other platforms and programming language also have the advantage of a larger pool of skilled talent to work on them. It is unfortunate the AS/400, IBM i seams to have been dropped by nearly all college campuses. We can help improve your system, keep it running, and help you train programmers and operators to use the system. Even though we think it is great, we realize there can also be compelling circumstances to leave the platform. We are happy to convert you to another platform. We will not judge you! 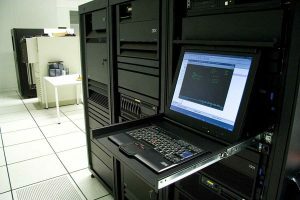 We are also fully capable of moving to the AS/400, IBM i System should that be what you are looking for. We have several home grown utilities, practices and methodologies to add new code fast using RPG, Java or PHP. We’ll train your team to replace if you like! Our subfile generator will let a brand new programmer create amazing and readable programs in 1/20th of the time. We have several complete systems for the AS400. Our accounting system can easily replace your accounting system and add modern capabilities. If you come on board with us long term, you can have any of our existing software for free! If you want a new application system written on the AS400 platform, no one can write it faster, more reliably and affordably than we can. No one.